Dassault designed the Mirage F1 as a private venture, using its own funds, as a successor to its Mirage III and Mirage 5 fighters, with the F1 being a smaller version of the Mirage F2 being developed for the French Air Force. It was of similar size to the delta-winged Mirage III and V, and was powered by a SNECMA Atar 9K turbojet as used in the Dassault Mirage IV, but unlike its predecessors, it shared the layout of a swept wing mounted high on the fuselage and a conventional tail surface as used by the F2. Although it has a smaller wingspan than the Mirage III, the F1 nevertheless proved to be superior to its predecessor. It can carry up to 43% more fuel, has a shorter take-off run and better maneuverability.The first prototype made its maiden flight on 23 December 1966. Despite the prototype crashing on 18 May 1967 due to flutter, killing its pilot, an order for three prototypes was placed on 26 May 1967, the larger and more expensive F2 being abandoned. In order to comply with the French Air Force's requirement for an all-weather interceptor, the first production Mirage F1C was equipped with a Thomson-CSF Cyrano IV monopulseradar. The later Cyrano IV-1 version added a limited look-down capability. However Mirage F1 pilots reported that the radar can easily overheat, reducing its efficiency.First deliveries to the French Air Force took place in May 1973, entering squadron service with EC 2/30 Normandie-Niemen in December that year. Initially, the aircraft was armed with two internal 30 mm cannons, and a single Matra R530 medium-range air-to-air missile carried under the fuselage. This is the original boxing from 1983, so you know that the kit is free from flash and other age related defects. Typical of the era, the kit is light on inserts, and in fact, I don't think this one has any optional bits and pieces though it does have a few options. Cockpit is quite basic with a generic seat that fits into a partial tub with a control stick and instrument panel. A figure is provided, but not to fit in the cockpit but to stand beside the finished model. I'd hunt up a nice replacement seat. I'd also put a small amount of weight in the nose just to be sure. The intakes are quite shallow, but then so is the exhaust. Again, this is an 80's kit, making it over 30 years old and so not cursed with minute detail. While the fin is molded in two parts, the wings and tail planes are single molds. This means that the holes are already opened on the lower wings for the pylons. So are the fuselage holes. On the fuselage is a pylon for the single fuel tank. Wings will get a pair of Matra 530 missiles on the pylons and Magic missiles for the wing tips. Landing gear is nicely done and you get the option to have the speed brakes open. Note that the ventral fins are also separate pieces. A boarding ladder is provided and you can pose the canopy open though there will not be much to see. Resin replacement cockpits have been done so you can add the detail there if you want. There is also a nose refueling probe, which was pretty standard stuff. Note that this is a straight Mirage F.1C so you cannot build the later F.1CR with this kit. There are other boxings for that. All the markings options are in the air superiority scheme of blue-grey uppers and silver (painted, not bare metal) undersides. The options all have the large unit tail markings with one being the box art plane from EC 1/12. You can also do the box art unit with the yellow and black tiger stripes on the fin, though you have to paint that. The other is from EC 1/5. 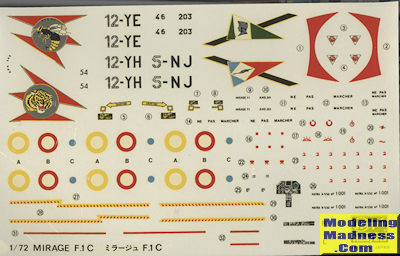 Decals are the thick variety that Hasegawa used for decades, but despite their age, they may well still be viable. I've used ancient (model kit-wise) Hasegawa decals and had success with them. Aftermarket is still available. 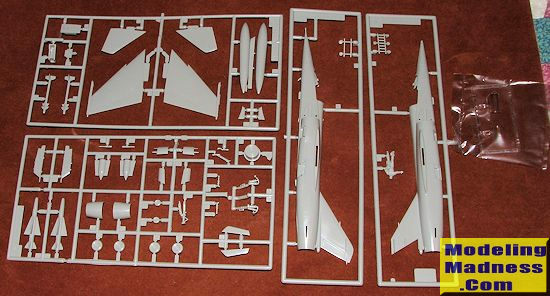 It is a toss-up as to which kit, this one or the ESCI 1/72 Mirage F.1 is the better. There were also a Heller kit from the raised panel line age which isn't all that bad. The kit is simple enough to please the newbie or someone who wants a break from fiddly. The end result is a nice looking model that will be a nice addition to your display area.